AT LAST! I finally got a bar of Zotter chocolate from the lovely Dom at Chocablog and he gave me this lush Zotter strong coffee chocolate bar. He knew I wasn’t at all keen on bacon and so shared his coffee bar with me. As you can see, the wrapper is lovely. It is cute and reminds me of coffee art which I just have tons of fun wasting time on the train flicking through. The gold foil gives it a really lush perception and the gold foil wrapper on the chocolate filled me with anticipation. The wrapper itself is imprinted with a bit of the story of how the chocolate is made and how they go from bean to bar at their factory. It’s always lovely to have a bit more of the story from the manufacturer. My first impression was that it looked like a giant chocolate covered biscuit. At 70g it would be one heck of a chocolate covered cookie! Obviously having skipped having a proper dinner was showing through. 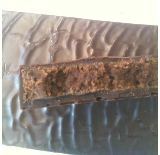 The dark chocolate was rippled across the top and the bar itself is very thick. If you can see, it is a thick bar which is quite heavy and the ingredients do list alcohol. Wow… so dark chocolate *and* booze with coffee – there’s a recipe for enjoyment. The “noble chocolate” made from certified organic and fair-trade chocolate is quite bitter. The dark chocolate here is slightly sweet and it is lightly bitter. It’s hard to discern the chocolate though because the coffee is so intense. The coffee cream is a single huge slab. Joy. Just lovely coffee joy without it being too sweet. I have been searching for coffee chocolate bars, and I have no idea how this got passed me. Will have to find myself some, I guess I always just associate Zotter with the bizarre and not flavours like these.